If your organization requires approval for posting new positions, you will be prompted to submit new positions for approval as the final step in creating a position. 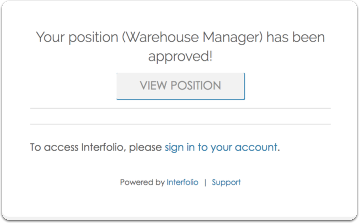 Organizations can also set up position approval workflows to accomodate requirements for more than one step in the position approval process. The administrator(s) who are designated to approve new positions will be notified that you have submitted a position for approval, and can either approve the position and send it forward to the next step in the approval process, or send it back for changes. If changes are required, you will be notified of the necessary changes and can resubmit the position once the required changes have been made. This article explains more about the process of approving positions. To get a view from the other side of the approval process, see the help article on how to require approval to post new positions. See here for detailed instructions on how to create a position. 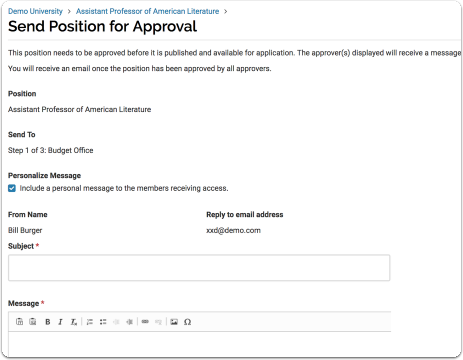 You can personalize the message that will go out to the designated approver and click send to submit the position to the first step in the position approval process. Some organizations will only have one step in the position approval process, but others may have multiple steps. Notice that the current step and the approver who is currently reviewing the position will appear listed. You can continue to make updates to the position while awaiting approval by clicking the the "Position Actions" menu.